Our latest Q&A responds to common questions the US Cargo Control sales team answers about rigging, specifically guy wire and its components. Why is it called guy wire? Guy is defined as a rope, cord or cable used to steady, guide or secure something. Guy wire is used to stabilize and secure antenna and utility towers. The structure stays in place when the wire is attached to the tower and then anchored to the ground, creating a diagonal line. The tension from the cable and angle of securement stabilizes the tower, helping it withstand weight and wind. What’s the difference between drop forged, malleable and precision cast in wire rope clips? 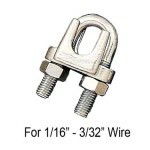 Drop forged wire rope clips are made for heavy duty jobs and are great as guy wire clamps. The drop forged steel coating provides extra strength and protection from the elements. However, these clips are not meant for overhead lifting. They meet federal specifications FF-T0276b. Type III. Precision cast wire rope clips are made of marine grade stainless steel and are typically used for water work. They are resistant to the salt in sea-water and materials used to de-ice. Their resistance to corrosion makes them ideal for harsh elements. These clips meet FED.SPEC.FF-C-450D. Malleable wire rope clips are a softer clip typically used for light-duty work. They are often used to clamp the loose end of wire rope after forming an eye. How is a shoulder eye bolt different from a regular eye bolt? 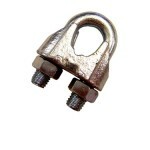 Shoulder eye bolts and regular eye bolts differ in their intended uses for rigging. A regular eye bolt can be used for many different jobs, but for rigging, it should only be the tool of choice for vertical techniques. 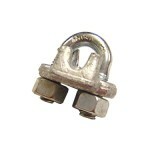 However, shouldered eye bolts can be used for angular jobs. The shoulder helps protect the shank from bending. Keep in mind, angle loading reduces the bolt’s rating. If you have questions, be sure to contact the US Cargo Control sales team at 800-866-3585. People can also email TowerProducts@USCargoControl.com.